Update: I’m about 28 per cent through ACIV Black Flag and just gave up on perhaps one of the most frustrating chase missions I’ve ever endured in a game. After about 12 attempts, and a few swear words, I gave up and turned off the console. Without spoiling anything, Kenway has to track a ship through a swampy marshland then follow a rowboat – he’s on foot – until he’s spotted eavesdropping on a conversation then has to chase a British captain. It seems as soon as the chase starts, Kenway was reluctant to actually run and it took a few metres for him to wake up and start running: what follows is a chase that seems destined to fail as Kenway is hampered by all matter of objects (paths blocked by collapsed rubble, guards, explosions) in his quest to chase down a captain. I just about reached captain, but he apparently got to his destination, desyncronising the mission. The mission was just frustrating, to be honest, and there’s no need for frustrations like this. On a more positive note, earlier in the game I found a diving bell, which meant I could now dive the various shipwrecks I’d come across previously and not been able to do anything. You can also hide from sharks in seaweed. I don’t think you can punch them, though. There are lots of things to climb in Assassin’s Creed IV: bell towers, windmills, British troop fortifications, Mayan outcrops, big trees. I like climbing things in Assassin’s Creed games. It’s probably one of my most favourite things to do. Whenever I arrived at a new location in the game – it’s a pretty big game world so there are lots of locations to explore – I pull up the map, set the marker to the nearest syncronisation point and head for it. I’ll then climb to the top of the building/bell tower/mayan temple and look out, often taking in the breathtaking view that stretches out below me, before free-falling into a conveniently placed pile of hay. 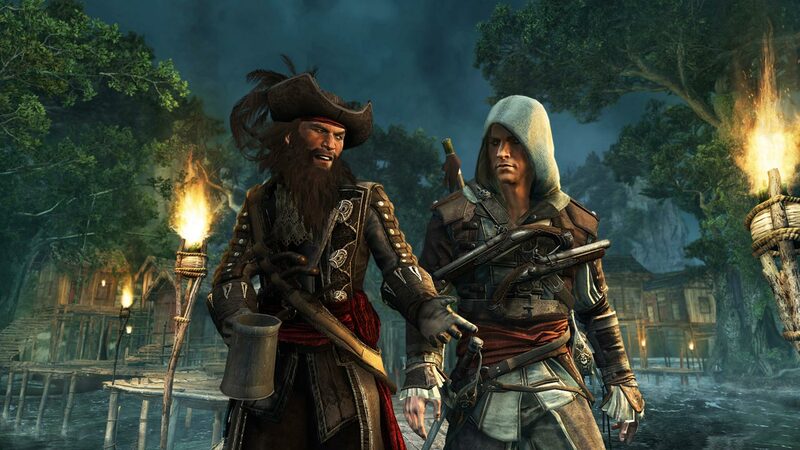 For me, Assassin’s Creed IV is an infinitely better game than its predecessor, and much of that is due to the game’s main character, pirate Edward Kenway, who is a billion times more interesting than Connor from AC3. I also wasn’t that taken with the American setting of AC3. It just seemed a tad uninspiring. 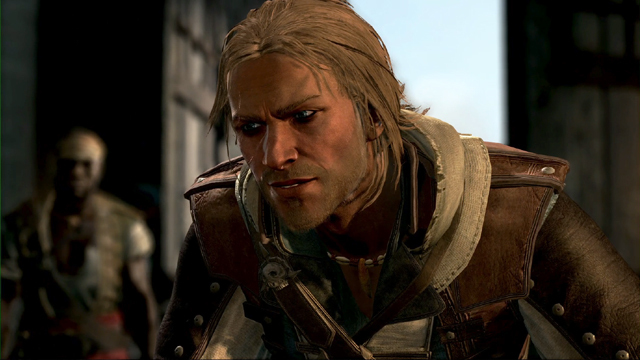 I felt Connor had little personality and I think part of the charm and appeal of Kenway for me is that he’s a pirate: That’s always good for fun times but he’s also a bit of a scoundrel, a man who is prepared to step outside the bounds of the law to the get the job. He’s an interesting character. As I write this, I’ve completed about 21 per cent of the ACIV so far, but I’m not sure whether that’s 21% of the entire game or just of the game world. Most of the game is set in the Carribean and most of it seems open from the start. I’ve only come across a couple of points where the game has told me that a particular area wasn’t available yet. I have to say, though, I found the opening couple of hours pretty uninspiring but I’m glad I’ve stuck it out. Once you leave the rather restrictive location of Havana there’s a huge and varied game world to explore, with much of it taking part on the open seas with you captaining the Jackdaw, Kenway’s ship, which you can upgrade by attacking merchant ships and looting warehouses stationed at British bases. The free-running seems more fluid this time around, although every now and then Kenway will come across a wall that for some reason isn’t climbable (although a similar one nearby is) or get stuck in a corner because I guided him the wrong way, but it happens a lot less than it did in other AC games but I’m surprised at the inclusion of one what I like to call insta-fail mission where guide Kenway through a jungle avoiding what seemed like the 2 million assassins patrolling the place. Well, it seemed like 2 million assassins were there. It was one of those mission that whenever you were spotted that was it and you had to restart at the last checkpoint. I made it through, eventually, but I did yell at my TV a few times during that mission. Things I like doing in ACIV: Whistling at a guard (not in a sexual way) to catch his attention then stabbing him when he gets too close and pulling him into the undergrowth, hiding the body. It’s funny, though, when you knock a guard out and they writhe around and moan, and a nearby guard doesn’t hear a thing! (Video games, eh? ); Taking on a ship more heavily armed and stronger than the Jackdaw – and coming out victorious! ; Firing a berserk dart at a soldier and watching him fight other guards near him. Things I don’t like in ACIV: Those eavesdrop missions; trying to attract one guard’s attention but inadvertently attracting the attention of two, meaning they spot you; insta-fail missions with 2 million patrolling assassins. The time spent on the high seas is great fun and the sea battles are a blast but it pays to spend money early on upgrading the Jackdaw’s cannons and hull strength. As the game progresses many of the missions take place in British gunship and frigate-infested waters, and against mortar-fortified bases, and a strong and powerful ship will get you through with less damage. ACIV is also a game within a game, if you will, as the Kenway storyline is part of a TV series produced by Abstergo Entertainment (remember the Abstergo agents in the other AC games that were hunting Desmond Miles), which you, the player, work for. It’s a little confusing at times. All and all, I’m enjoying my time with Assassin’s Creed IV. I shares a lot of DNA with the previous games but it seems Ubisoft have listened to many of the complaints with previous installments and done its best to remedy those. That said, whether I have the fortitude and stamina to visit every single location and collect every single collectible is another thing (for example, I can’t be bothered chasing the flying shanty fragments). Some missions require a little grinding, too, like one which needed a much tougher Jackdaw than I had so I had to plunder a few more ships and warehouses to get enough stuff to upgrade her hull and armaments. ACIV is a much better game than AC3, which had a boring lead character and I just didn’t find fun, but I wonder how much life is left in the series? This is about the sixth full console AC game and there’s only so much assassinating, collecting and free-running you can do until the formula starts getting real tired. The AC series might be nearing that point now. Before I even read the review, this is the best review title ever. Thanks very much. It sort of just popped into my head! Thanks for reading.